I think most of us now accept that eating less meat and heavy foods is the way to go - though "meat-free Monday" still annoys the hell out of me. Truth is meat has only been on my menus a couple of times a week for years now, sidelined for more vegetables, grains and fish, and I know I'm far from alone in moving to a healthier, more thoughtful way of eating. 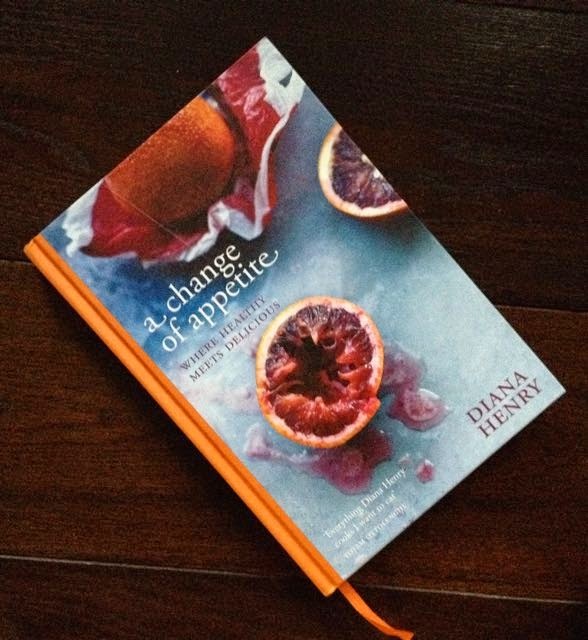 That doesn't make Diana Henry's latest book, A Change of Appetite, any less welcome. In fact it's a book for the way many of us eat now and, certainly in this house, it's finding an appreciative audience. The focus of the book is the author's perception that people want to eat more healthily and the acceptance that it would be good for her to make some changes to her own diet. This book came out of curiosity about what 'healthy eating' means and how to achieve it without compromising on the sheer enjoyment of food. The guiding principle for the author was that dishes had to be delicious, their healthiness being a bonus, and there would be a thoughtfulness about the ingredients borne out of wide reading (there is an impressive bibliography). This is not a diet book. Diana Henry doesn't tell you what you can't eat - that was a relief because frankly no-one is going to take away my cake - but what you can. In that vein, I share Diana Henry's belief that "The problem isn't with what you eat at one meal, but what you eat across the board". A Change of Appetite offers the, now, familiar format of the four seasons, each with reminders of ingredients that are at their best early, mid and late in the quarter. Along with stand-alone recipes there are menus to help bring balance of flavour and nutrition to a meal. Recipes globetrot with dishes like Vietnamese Rice paper rolls with nuoc cham; a Lentil and roast tomato soup with saffron from India; an Italian dish of Lamb scottadito with summer fregola; a North African Spiced mackerel with kamut and as pretty a Persian Salad as you'll ever see; a recipe for Georgian Roast chicken with walnut sauce and hot grated beetroot; and there are dishes from Northern Europe like Citrus marinated salmon with fennel and apple salad and Braised venison and beetroot with horseradish. Puddings are on the menu but with an emphasis on fresh and light, like Blood orange and cardamom sorbet; Raspberries with basil and buttermilk sherbet and Blueberry and gin jellies. Happily, you'll find Pistachio and lemon cake and a Blackberry and apple rye galette too. It's important to know that as Diana Henry says "there is lots of big front-of-mouth flavours, such as chilli, ginger and lime, the kind of thing you want when you aren't eating starchy or rich food". Spices are a prominent feature and, if they're something you're not used to, the first time you make a dish you may want to reduce the quantities just a little in some recipes. So, what have a I tried so far? 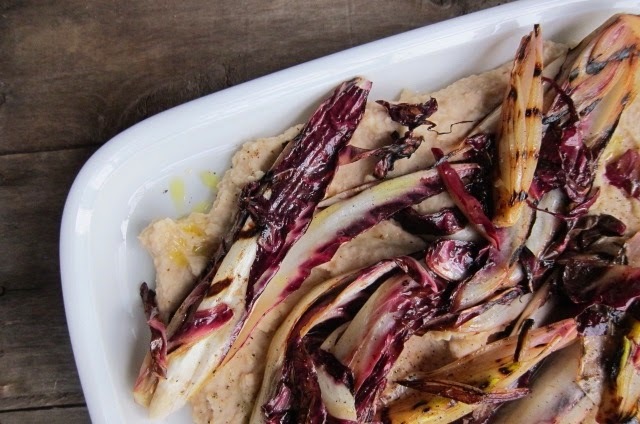 Radicchio and red onions on white bean purée with its mix of bitter, sweet and earthy, felt healthy and satisfying eaten on its own for lunch but there are suggestions for what to serve it with and how you can change the basic recipe (a feature of many recipes in the book). 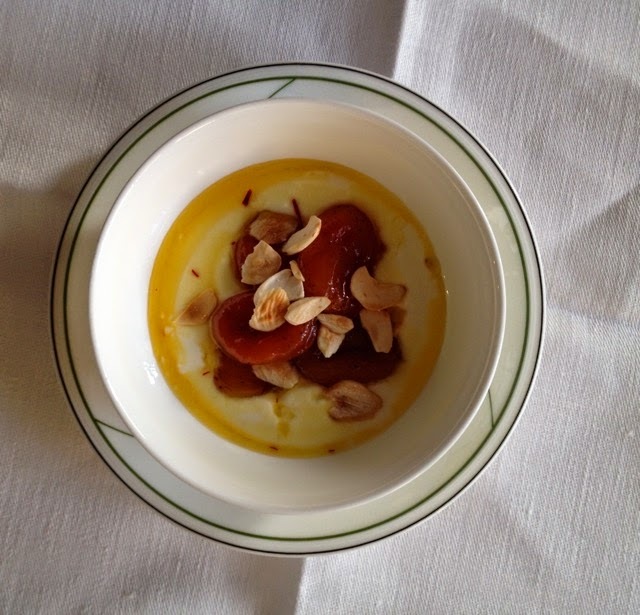 Yogurt with honeyed saffron syrup, almonds and apricot compote was a big hit. The combination of apple juice, cardamom and citrus infused dried apricots with yogurt and a saffron and orange-flower water syrup is a delicious one and visually it's a stunner. I didn't have agave syrup so substituted a slightly lesser amount of honey. It's easy to overdo saffron, so be cautious. Cardamom too needs to be used sparingly for as Diana Henry says, cardamom "needs to move through a dish like a ghost" . Once all the elements of the dessert were put together, all was perfection. 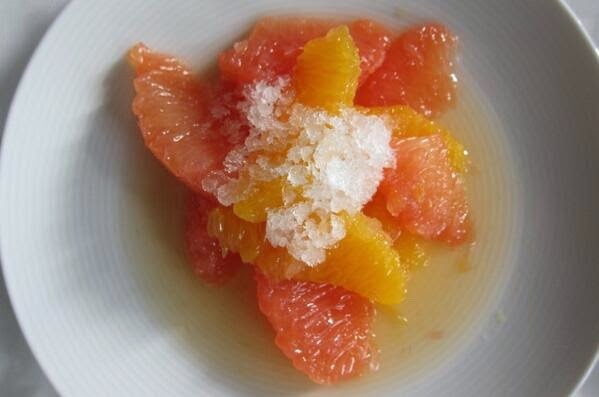 Citrus compote with ginger snow is another visually arresting dessert. I'm a big fan of lime so appreciated its liberal use in this dish. The "snow" is a granita that packs a big ginger punch and could be a little too powerful for some. Dishes I'm really looking forward to trying include Smoked haddock with Indian scented lentils, inspired by Kedgeree; Red mullet and saffron broth with corfu garlic sauce; Roast tomatoes and lentils with dukka-crumbed eggs; and, when summer arrives, a Middle-Eastern inspired Cucumber and yogurt soup with walnuts and rose petals and Poached white peaches with rosé wine jelly. I could go on. I'm wary of the blurb on book covers but in this case Yotam Ottolenghi's "Everything Diana Henry cooks I want to eat" quote sums up my own feelings about A Change of Appetite. All this and Diana Henry's scholarly and engaging writing style. If you're still wondering if this book is for you, take it from the shelf and read the two pages at the back of the book ''Final Thoughts'. Full of good sense reminders for a more thoughtful way of eating. I think you'll be convinced. As ever, with Diana Henry's books, the photography, by Laura Edwards, is beautiful and evocative. I love this book and it's already earned its keep on my bookshelf. I know I'm going to make a lot of the recipes, and I'll feel all the better about having my occasional cake.